Tomato-based stews are simply delicious that’s why it’s a regular in our family menu. 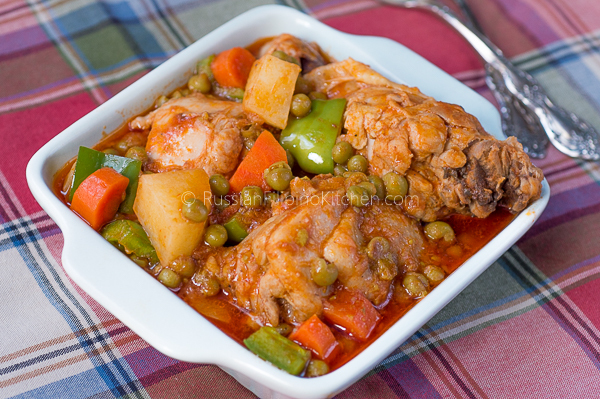 Caldereta is a Filipino-style stew in tomato sauce with meat and vegetables usually potatoes, carrots, bell peppers, and green peas. 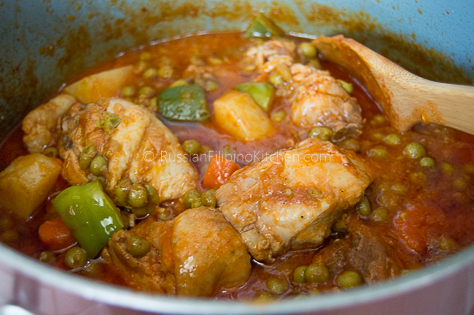 The original caldereta is made from goat meat but beef, pork, chicken, and even fish such as tuna can also be used. 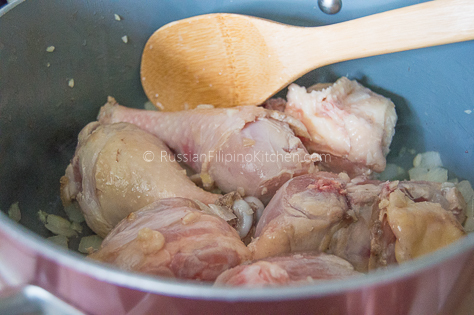 For today’s post, I am going to share how I make chicken caldereta for my family using bone-in chicken cuts (they’re more flavorful compared to boneless chicken meat). 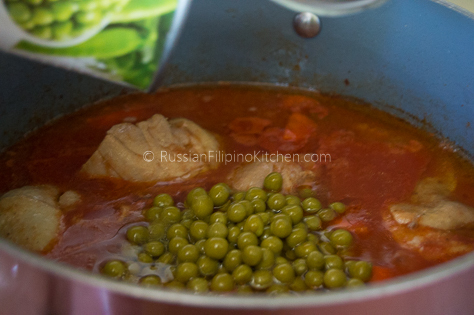 Caldereta dish is very similar to other tomato-based stews in Philippine cuisine, namely menudo, afritada, and mechado. 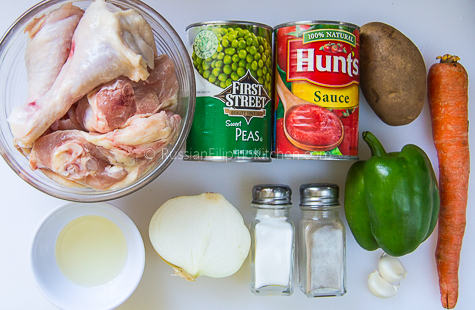 The difference among them is in the types of cut in the meat and the addition of extra ingredients such as soy sauce in mechado or raisins and chorizo/hotdogs in menudo. 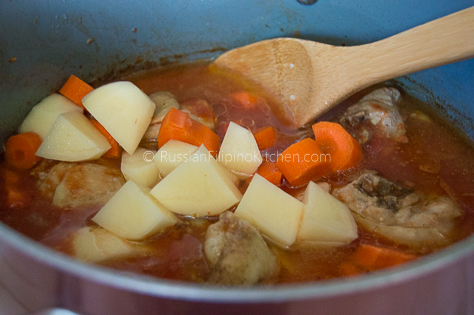 Caldereta often has liver paste added to thicken the sauce and it’s usually spicy. 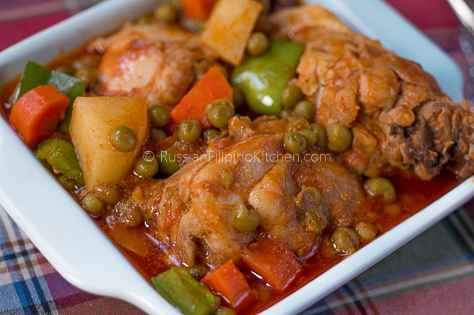 I omit this ingredient so this chicken caldereta is like chicken afritada with the addition of green peas. 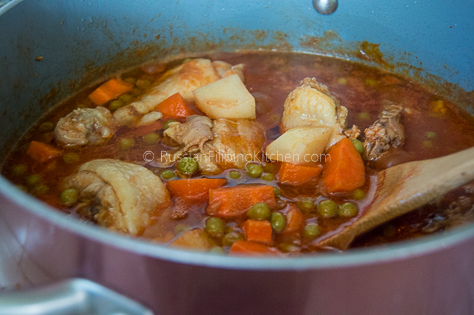 I’m a big fan of using Mama Sita’s pre-mixed seasoning for caldereta, but most of the time I love cooking the dish from scratch. 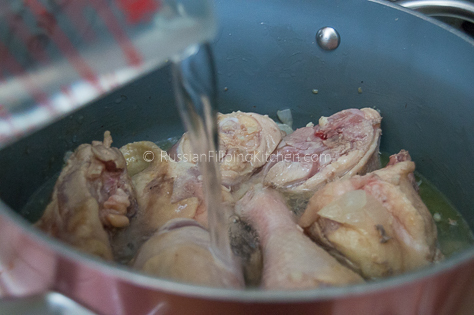 You can remove the chicken skin and trim off the fat from the meat if you like to make it healthier. But make sure you have plenty of boiled white rice to go with this dish. They’re a perfect tandem for a satisfying meal the Filipino way! 1. 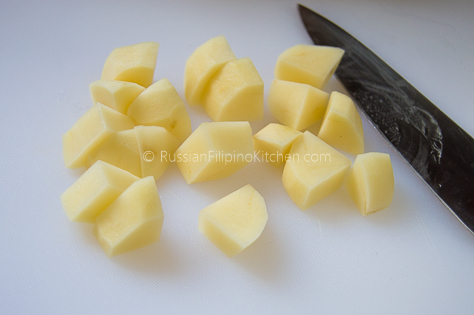 Wash and peel potato and cut into medium chunks. 2. Do the same thing with the carrot. 3. 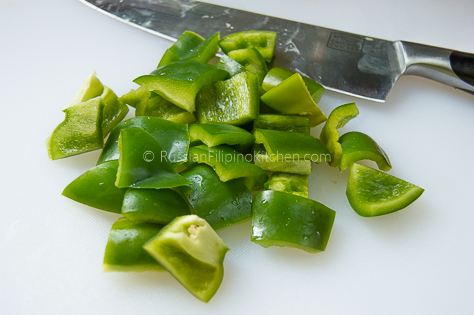 Wash and core bell pepper then slice into medium chunks. 4. 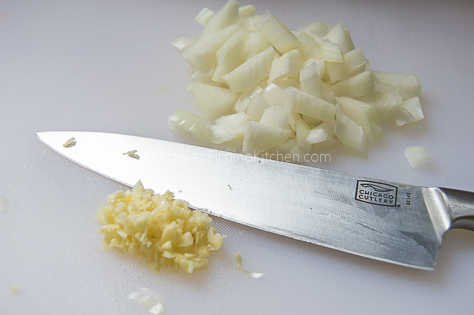 Peel onion and chop into small pieces. Similarly, peel garlic and mince. 5. Heat a large cooking pot over medium high. 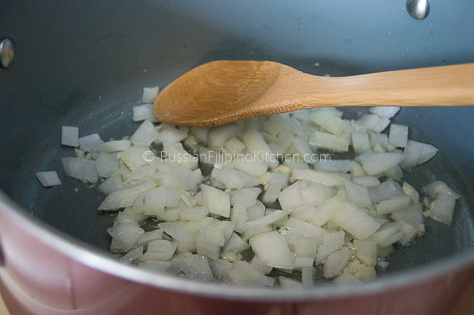 Add the oil and saute onions and garlic until fragrant. 6. 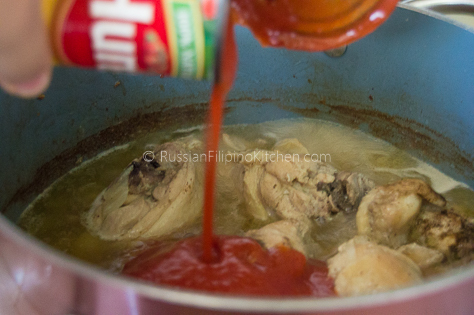 Throw in chicken pieces and saute for about 2 minutes on both sides until slightly browned. 7. Add water and season with salt and pepper. Cover pot and bring to a boil. 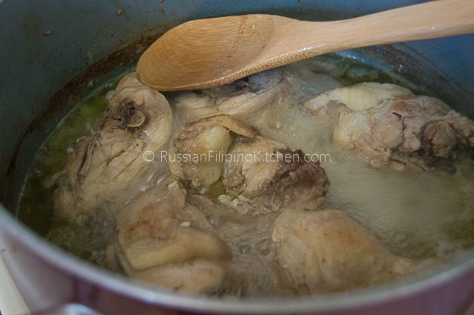 Once it starts boiling, lower the heat and let it simmer for 45 minutes until meat is tender. 8. 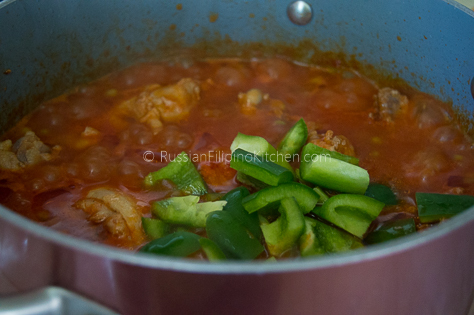 Add tomato sauce, carrots, and green peas and simmer until vegetables are tender, about 10 minutes. 9. Throw in the bell peppers last and cook for 2-3 minutes until slightly limp. 10. 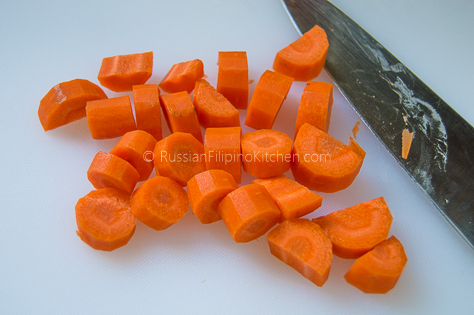 Remove from heat and serve immediately. Hello Claire! Thanks for the feedback, and you’re welcome!